Mid Weight stretch fleece tights - ideal to wear alone or as a liner for thermal insulation. The waist is a wide jacquard knitted elastic band that keeps the leggings in place during fitness activity. You won't have to pick or tug at these tights to keep them in place. When you exercise or move around, they become invisible like a second skin. Luxury fabric that is soft yet rugged for fitness abrasion like running, yoga, cross country ski, cycling and active events. Stay warm and cozy during cold weather activity in the outdoors with our thermal fleece tights made with the highest quality four way stretch, brushed polyester fleece. It is very rugged and yet very soft. Fabric: Pro-Stretch Single Veloured 4 Way Stretch, Thermal, Fleece with Jersey Face and Fleece back. It is an 8ounce weight knit with 88% Polyester-12% Spandex. Comfort, warmth, Movement and Functionality.High end Polyester/Lycra fabric for performance oriented people. 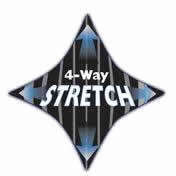 The stretch fleece tights are made of high performance zirotek which is engineered after the polar bear's fur. The hollow core of filament yarns trap air to improve thermal insulating characteristics. The heat is stored in the hollow core center and released back to your body to keep you warm the same way polar bear fur works. The zirotek fabric allows you to enjoy all outdoor activities and stay warm in the cold climate. It is warm with out weight feature provides a full freedom of movement which is good for garments where warmth really counts. 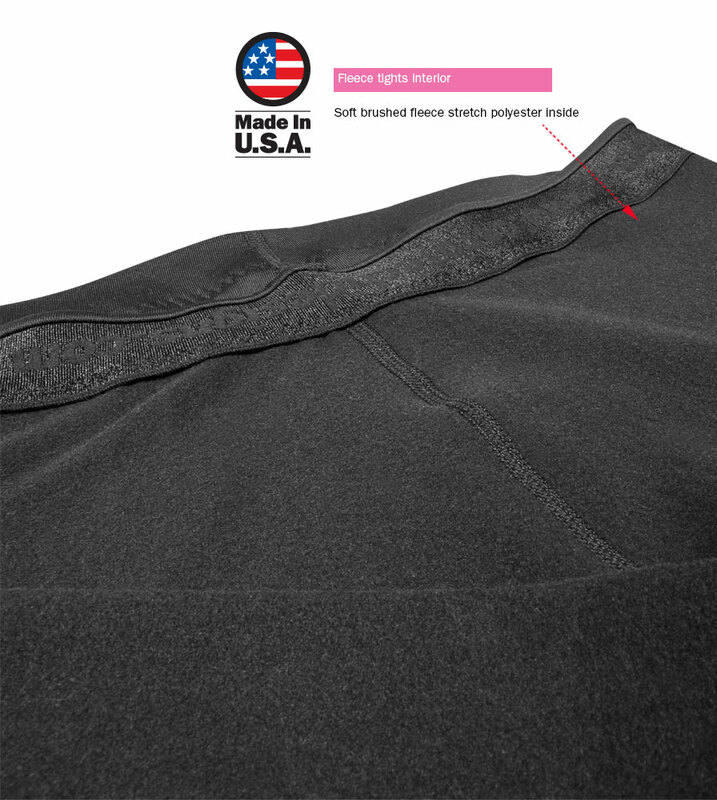 Fabric is all way stretch poly spandex with a brushed fleece internal and smooth exterior. * Wide knitted jacquard waist elastic is very comfortable and can be rolled down. Sizing Notes: We recommend using this size chart for spandex workout tights. They fit like you see in the photographs. Nice fit, nice weight, comfortable and no logos! I appreciate the simple design and the waist that is actually at the waist! I also really like it that there are no logos. Hard to get gear these days that doesn't try to turn me into a billboard. I can not say enough about all the aerotech items I own, including padded shorts, non padded shorts, regular leggings/tights and the fleece lined, and two jackets. The are attractive and very durable. I wear a lot of skirts in the summer and a pair of the shorts takes the place of a slip--and gives me the security that my slip is not showing! There are several things I particularly like about Aerotech's products: 1. they are made in the USA. 2. They are durable. 3. The actually fit someone with skinny legs and a round abdomen. I have tried many different brands of tights/leggings and they all have too short a rise. With that in mind I ordered a 3X. I am returning them because they are too big, especially in the legs. I have already ordered and received the 2X and they fit wonderfully. I frequently recommend Aerotech clothing to women of size because they do fit so well.